Solitaire refers to any card game designed for a single player. In most solitaire games, the player uses a standard 52-card deck to work through a series of plays and conditions to reach a victory point. If he becomes stuck, he must reshuffle the deck and start again. Solitaire has exploded in the computer age, providing Web surfers and office workers an easy way to spend a few minutes on their computer. Klondike is the definitive form of solitaire. The player shuffles the deck and sets down seven piles of face-down cards--one card in the first and each succeeding pile one card higher than the previous one. The top card in each pile is turned face up, and the player then turns over the remaining cards in the deck. If any card is one rank lower than a face-up card and of an alternating color, it may be placed on top of that card. 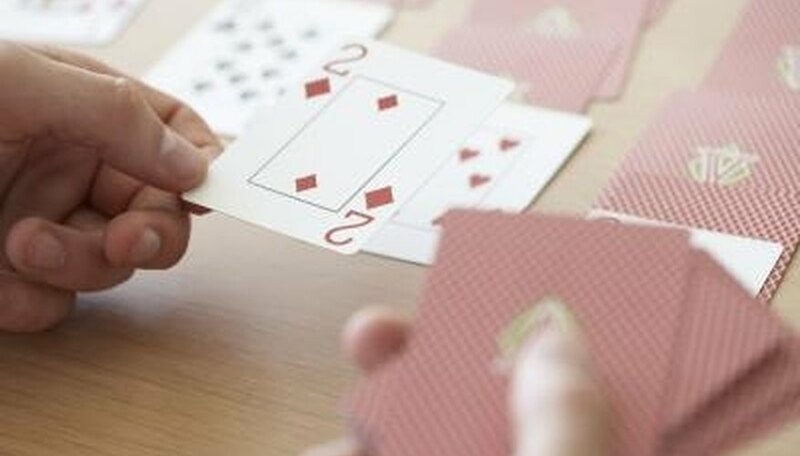 Face-up aces may be used to create a new pile, one for each suit, to which the player may add other cards of the same suit in order. The object is to work through the entire deck until the player has one pile for each suit. In Golf, the player shuffles the deck and lays out seven piles of five cards each, face-up. He then turns up one card from the remainder of the deck and sets it aside as the foundation. The object is to get all of the cards from the seven piles onto that foundation before the player can draw through the remainder of the deck. Start Canfield by shuffling the deck and setting 10 cards aside to form a reserve. The next four cards are drawn and set down as the basis of four separate piles called tableaus. A fifth card is drawn and placed above the four piles to serve as the foundation--three other foundations will be built from the same card in the other three suits. The object is to get every card into the foundation piles, ranked sequentially in order. Spider entails two decks of cards, which the player shuffles together. He then deals 10 columns of cards, each with the top card facing up. Face-up cards can be moved on top of any other card of the same suit ranked one higher. If you move a face-up card from the top of a pile, turn the highest face-down card up. If you have a complete suit of cards ranked sequentially from king to ace, you can set it aside. The object is to set two copies of all four suits aside in this manner. With Monte Carlo, the player shuffles the deck and lays out 25 cards face up in five rows of five, forming a square. He can remove cards in pairs, provided they are of the same rank and side-by-side or with touching corners. Empty spaces are refreshed from the remainder of the deck. Play continues until all 52 cards have been removed or the player becomes stuck.